The specimen you see in the photo was dredged up with 129 others from the Challenger Deep. This amphipod is only about 4.5 cm long, but in amphipod terms, that’s a world record. 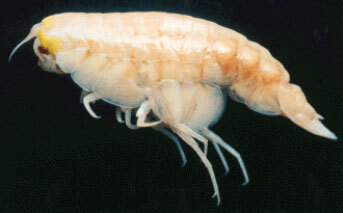 Amphipods are flea-like creatures that are one of the most plentiful species of living things in all the worlds’ oceans. Many species of amphipods are from 1 to 10 mm long, with the largest specimens growing up to 30mm. Finding living creatures at the bottom of the ocean in the Challenger Deep was exciting for the scientists who discovered them. They were equally surprised by the size of these world-record holding amphipods. Amphipods are members of the crustacean family - crabs, lobsters, shrimp.